The San Antonio Police Department is trying something new this year for their recruitment period. 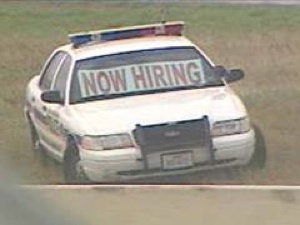 The department has parked patrol cars in three locations with “Now Hiring” signs in the windows. A red light camera in Knoxville, Tennessee was riddled with bullets early yesterday. The ticketing device, located at the intersection near Broadway Street and Interstate 640, was struck by three bullets at around 2am, leaving the camera’s lens shattered and incapable of ticketing. WATE-TV reports that police found Clifford E. Clark III, 47, in a minivan near the scene of the incident with a .30-06 rifle. Clark was arrested and accused of felony vandalism for damaging the automated ticketing machine operated by Redflex, the Australian company that Knoxville hired to run the program. 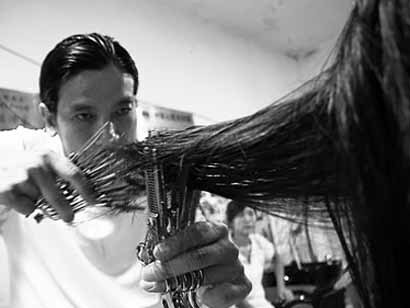 A barber in China has set a world record by cutting a customers hair with 10 pairs of scissors simultaneously. Wang Zedong, 41, of Jiujiang city, Jiangxi province, demonstrated his stunt in a television studio with hundreds of people, and Guinness officials, in the audience. In less than three minutes, Wang cut the models hair, reports Zhejiang Online. Wang says he started practicing this stunt to try to cope with the number of customers coming to his barbers shop.